A tidal wave of terror sweeps southern Asia after the Japanese capture Hong Kong and Singapore. When the U.S Army Chief of Staff implements Operation King Cobra and sends the highly trained and swarthy special missions agent, Jonathan Preston, into Asia, things begin to turn around. After Preston teams up with two British Special Operations Executive agents, Miles Murphy and Henri Morreau, the trio wreaks havoc on Japanese supply lines, foils sabotage and assassination attempts by Japanese agents, frees allied prisoners of war and begins shutting down the secret biological and chemical warfare programs of the Japanese Army’s Unit 731. After nearly a year of solid success, the top Japanese hit team is now after the Cobra trio. When the two teams collide, there is only one outcome: death. 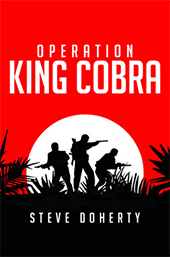 Based on historical fact and real life accounts, Operation King Cobra takes you on a journey through some of the toughest terrain in Asia; following secret agents through dense jungles, over steep mountains, through crocodile filled rivers and into exotic ports of call. You’ll join some of the top secret missions that changed the course of the war in Asia and altered history. Be part of Operation King Cobra!